Republican senator Lindsey Graham calls PA's application to join the ICC "incredibly offensive". Senior Republican senator Lindsey Graham said on Monday that the Palestinian Authority (PA) could lose its annual U.S. aid if it files a lawsuit against Israel at the International Criminal Court (ICC). 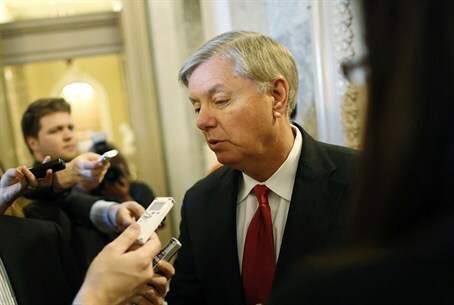 Graham, part of a seven-member delegation of senators visiting Israel, Saudi Arabia and Qatar, said that existing legislation "would cut off aid to the Palestinians if they filed a complaint" against Israel, according to the Reuters news agency. Speaking at a news conference in Jerusalem, Graham called the Palestinian step "a bastardising of the role of the ICC. I find it incredibly offensive." "We will push back strongly to register our displeasure. It is already part of our law that would require us to stop funding if they actually bring a case," said Graham, of South Carolina. The PA applied earlier this month to become a party to the Hague-based ICC and recognized its jurisdiction to retroactively cover a period including the Gaza war. Last Friday, the ICC announced it was launching a "preliminary examination" into possible war crimes committed by war crimes against Palestinian Arabs. President Barack Obama's Democratic administration has said it does not believe “Palestine” is a sovereign state and therefore does not qualify to be part of the ICC, but has not explicitly threatened to withhold aid. Washington did, however, indicate it was reviewing its annual $440 million aid package to the PA because of the decision to join the ICC. Graham on Monday urged the Palestinians to re-evaluate ICC membership, saying he supported their aspirations for statehood but opposed joining the court as a "provocative step" against Israel. Republican Senator Rand Paul recently introduced a bill that would immediately halt aid to the PA until it halts its effort to join the ICC. Paul’s bill, introduced a day after United Nations Secretary-General Ban Ki-moon said that the PA would become a member of the ICC as of April 1, would ban assistance until the PA stops the move to become a member of the court.